Yesterday I had a serious case of deja vu while driving in for a surgery. I vividly remembered a morning four and a half years ago when my hubby and I pulled up to the hospital for my ostomy operation. I had been in a tenuous remission after a severe flare had hospitalized me for a couple of weeks. I was so relieved that nothing had gone wrong and that I was actually going to have the surgery while in a fairly healthy state to rid myself of an organ that had been ruining my life. I was so eager that I wanted to run into the hospital and jump on the operating table. This time I was equally excited. Though I wasn’t anticipating giving an organ the boot, I was excited to rid myself of some pesky uterine fibroids that had been making my life very miserable. Just like with my ostomy operation, I was so happy when we pulled into the hospital and realized that nothing was going to get in the way of my surgery. Life happenings and a really busy work schedule over the past few months had made scheduling the surgery difficult. To top it off, two weeks ago I came down with a horrible respiratory bug and fever that also resulted in developing viral-induced asthma. There was a chance I was going to have to cancel, but I did everything I could to give my body a boost. I used sinus rinses and warm compresses, took Musinex and my asthma medications religiously. Most importantly, I rested and slept a ton. Three days before my surgery, my illness cleared up and I got the go-ahead from my doctor to proceed. Whew! 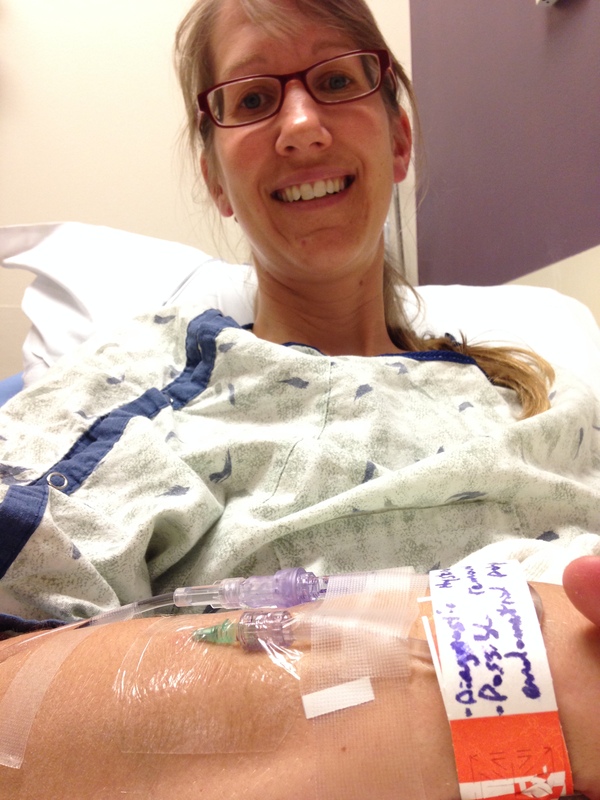 I am happy to be in pre-op and ready to rid myself of the fibroid mini-beasts likely lurking in my uterus. So what led up to such eagerness over this surgery? Last summer my periods started changing. They were becoming subtly more painful with light bleeding mid-cycle. By December, both these issues worsened exponentially. I had never experienced many menstrual cramps in the past, so I wasn’t exactly sure what “normal” ones were supposed to feel like. However, my gut feeling told me that the level of pain I was experiencing was unusual and that the heavy bleeding certainly warranted some investigating. I saw my doctor in the beginning of the year and it was determined that fibroids were likely the cause of my issues. I knew I had some. One–a subserosal type that grows on the outside of the uterus– was seen during my ostomy surgery. That one and then another had showed up on a pelvic MRI that I had to investigate hip pain a couple of years ago. A follow-up ultrasound showed that the second fibroid was probably an intramural type which grows within the uterine wall. Back then, I didn’t worry about these as they weren’t causing any symptoms. Now that I was experiencing worsening problems, I was scheduled for another ultrasound. This test showed that my older fibroids had probably been joined by a new buddy and that it was likely a submucosal type. These rarer fibroids are found on the lining of the uterus and can cause intense pain and bleeding. Yay! How lucky my uterus was to possibly have three types of fibroids. My body always likes to go big! Unfortunately, I am not a good candidate for a full on hysterectomy due to my ostomy, possible adhesions and the complications that could be involved. That type of surgery would only be done on me as a last resort. Fortunately, there was an option to at least investigate my uterine lining and–depending on what was found–try to remove and submucosal fibroids that were most likely causing the bulk of my issues. This procedure, called a hysteroscopic myomectomy, would be a minimally invasive and done under general anesthesia. A camera is inserted through the cervix and any offending fibroids or polyps in the uterine lining are removed. If all went well, I would only have to miss a couple of days of work while healing. I decided to have the procedure done. Of course I was nervous about some aspects of the surgery. One unlikely but possible complication was perforation of the uterine wall. If that happened and it was bad enough, there was a possibility of needing an emergency hysterectomy through my mid-line incision. I wondered what that would that mean for my ostomy. I have a wonderfully skilled, thorough and caring gynecologist that I definitely wanted to do the procedure. However, he didn’t do these surgeries at the same hospital that my colorectal surgeon works out of. I was told that if something went wrong and I needed an emergency hysterectomy, a general surgeon who was experienced with ostomies would join in the surgery. The thought of putting complete trust in another surgeon to work around my ostomy was difficult. I had to let go of those fears and hope for the best. In the end, everything went perfectly with the procedure. Two submucosal fibroids were removed and sent to pathology. My doctor is optimistic that this will fix the problems I have been having. There were no issues related to my ostomy either. I emptied my pouch before heading to pre-op. 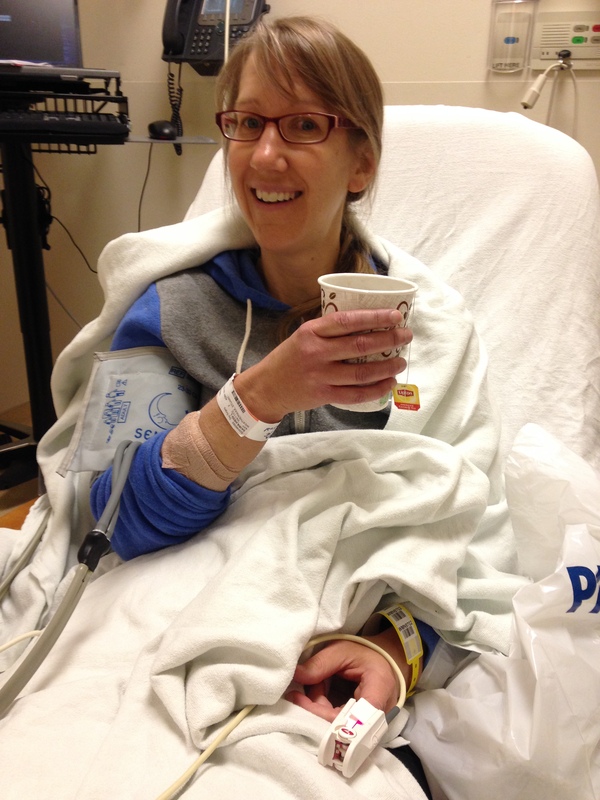 My surgery took a little less than an hour and I spent a couple of hours in post-op recovery. When I woke up my ostomy pouch was still pretty much empty… probably due to the fact that I wasn’t allowed to eat or drink for eight hours beforehand. Though I knew complications were rare, it was such a relief to wake up in post-op and see my belly intact! My surgery was scheduled for a Friday so that I could recover over the weekend, and so far my post-surgical pain hasn’t been too bad. I may even feel up to going to watch my hubby run the Colfax Marathon in Denver tomorrow! I am almost ready for discharge, but not before enjoying a hot cup of tea to go along with my dilaudid. I think I went through at least a dozen warm blankets during my time at the hospital. Can I please request this service for home? As I was experiencing all that deja vu on the way to the hospital yesterday, I was excited for the pain relief this surgery would hopefully bring, but I was definitely scared too. Just like with my elective ostomy surgery, I wondered am I really in bad enough shape to warrant having this done? With any surgery, even the more minor ones, there is an element of the unknown and also the vulnerability that comes with putting complete trust in a medical team. It can make it hard to take the leap… even when health issues are taking a toll on your quality of life. In this case, I was willing to take a chance to be free from misery. Here’s to hoping the surgery did the trick!